I am regularly asked to demo or 'lend' my Treo 650 both within a business and personal context. Judging by the number of times people (typically men) have stopped to 'immerse' themselves (to my utter surprise) playing the Hellfire game that I recently installed I would strongly suggest that palmOne include it in the next Treo application bundle that they make. 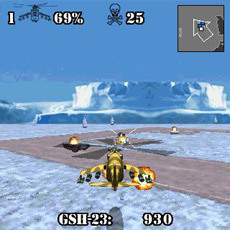 Hellfire is a 3D rendered helicopter gunship battle game taking you on 16 worldwide missions from frozen Alaska to desertic Tunisia. 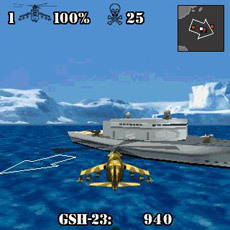 You can choose to pilot either a US Apache or Russsian Hind helicopter as you attempt to fulfill your mission to rescue prisoners while destroying all enemy tanks, helicopters, bases, vessels, jets and other defenses. One of the best things about the game is undoubtedly the maneuverability of the helicopter which responds extremely well to all your 5 way navigation commands while you're shooting the enemy using a cannon, rocket or swatter - you may actually find your head swaying after some extended gameplay. The 16 levels have four levels of difficulty which you can play in Trial, Campaign or Missions mode. Overall, Hellfire is an excellent, well designed, graphically rich and fun game that will keep you glued to your Treo for hours and one that will likely also provide you with more that one adrenaline rush (particularly if you select the 'double' speed mode). I have to second that. I've had Hellfire on my 650 for a couple weeks now, and it really does show off the Palm OS gaming potential. It feels like a PlayStation 1 game to me. If you play with earphones, it's a really immersive experience. PalmOne should definitely bundle this one. Zap! is a good game to bundle, but I think it's time for a change. I just wish there were MORE games like this for the Palm. The only other one that I found close is MicroQuad. Anyone? I will like to know your shipping cost to my client in Nigeria,get back to me asap.